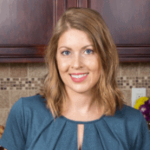 Published: Jan 21, 2017 · Modified: Apr 12, 2019 · By Jen Sobjack · This post may contain affiliate links. This Strawberry Yogurt Granola is a simple, crisp granola recipe that is perfect for breakfast. Made with oats, honey, vanilla, brown sugar, and Strawberry Yogurt ZonePerfect nutrition bars, you won’t be able to resist this satisfying snack. 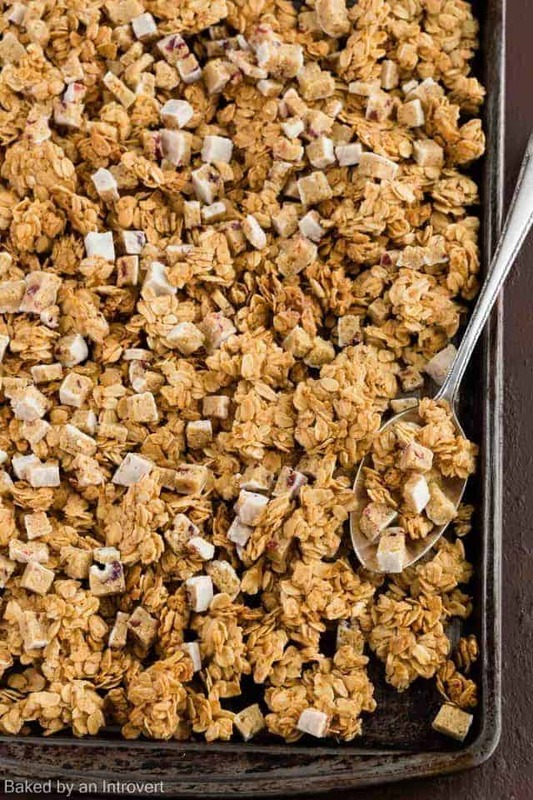 This granola recipe is simple and contains only 7 ingredients. Waiting for the granola to bake up nice and crisp is the most time-consuming part of the entire process. The Strawberry Yogurt ZonePerfect bars are diced and stirred in at the very end so they retain their tender chewy texture. The texture and flavor contrast is truly wonderful! This post has been sponsored by ZonePerfect. All thoughts and opinions are my own. I love making my own granola! Store-bought granola can be underwhelming and lack in good texture. I’m a texture fiend and if you’ve been around long enough, you already know this about me. Granola should be crunchy with tender bits of dried fruit or in this case Strawberry Yogurt ZonePerfect bars. This recipe is simple and a great way to get your New Year’s resolutions started off right. Eating healthy can be delicious! You need 7 simple ingredients to make today’s granola and it’s as easy as stirring everything together in one bowl then baking it until golden and crisp. Don’t mix the Strawberry Yogurt ZonePerfect bars in until the very end though. When testing the recipe, I found it best to wait. Enjoy your homemade Strawberry Yogurt Granola with milk, over plain yogurt, or all by itself as a snack. You may remember the chocolate chip cookie dough frozen yogurt I made recently. I also used ZonePerfect bars in that recipe. I’m enjoying the variety of flavors and the fact that they contain everything your body needs to feel satisfied while on the go. 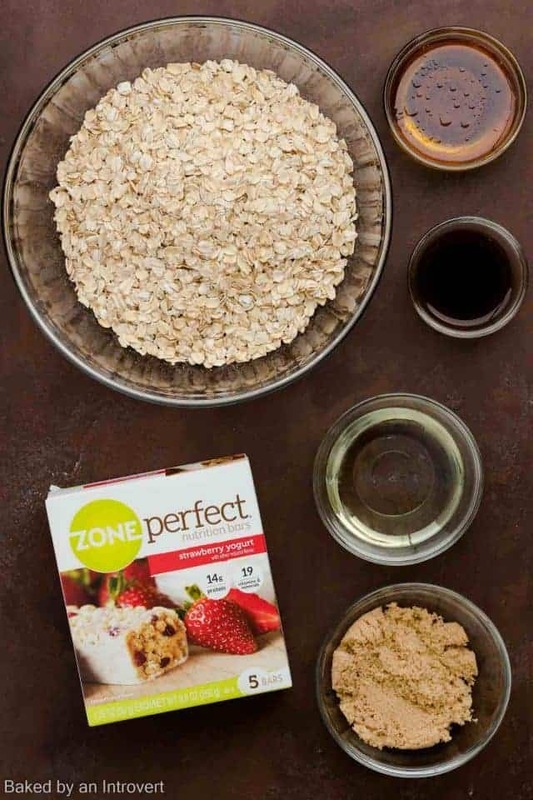 ZonePerfect is perfect for incorporating in granola because granola itself is a great, portable snack option. If you’ve set resolutions for adding more nutrition to your diet, these nutrition bars are a great place to start. You can find ZonePerfect at Target, Amazon.com, and most large grocery retailers. This Strawberry Yogurt Granola is a simple, crisp granola recipe that is perfect for breakfast. Made with oats, honey, vanilla, brown sugar, and Strawberry Yogurt ZonePerfect nutrition bars, you won’t be able to resist this satisfying snack. This granola recipe is simple and contains only 7 ingredients. Waiting for the granola to bake up nice and crisp is the most time-consuming part of the entire process. The Strawberry Yogurt ZonePerfect bars are diced and stirred in at the very end so they retain their tender chewy texture. The texture and flavor contrast is truly wonderful! In a small mixing bowl, whisk the coconut oil, honey, brown sugar, vanilla, and salt until well combined. Pour over oats in a large bowl and stir until well coated. Transfer to the prepared baking pan and press the mixture into an even layer. Use a stiff spatula to compress the mixture until very compact. Bake for 35 to 40 minutes, until lightly golden brown, rotating the pan halfway through baking. Cool to room temperature on a wire rack. Break the granola into pieces and stir in the ZonePerfect bars. Perfect for my office brunch. Thank you !